CES is a hotbed for elaborate concepts, but L'Oreal is deadly serious about getting its miniature UV Sense wearable into - and literally onto - people's hands. 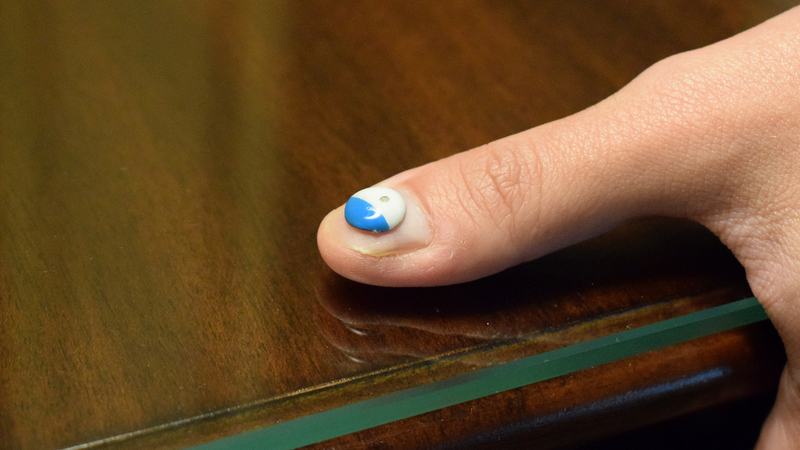 9 millimeters wide and less than 2 millimeters thick, its UV sensor tracks how much UV exposure you're getting and can be worn on a fingernail, as Guive Balooch, head of L'Oreal's tech incubator, models for us in a hotel room in Las Vegas. It can also be stuck on a watch, or even a pair of sunglasses. The sensor will then send that data to your smartphone via NFC - pretty clever for a wafer-thin sticker that's no bigger than, well, a fingernail. That makes it all the more surprising that L'Oreal is the one doing this. "We don't want to be a tech company," Balooch told us. "We want to use technology to get people to use the product the right way." So yeah, if you want to be cynical about it, it's a clever way of pushing people to L'Oreal's skin protection products - similar to how Amazon uses its gadgets to nudge you to its store - but L'Oreal's been doing this a while with its UV Patch wearable, a temporary UV-sensing tattoo that L'Oreal has been giving away for free. "We put over a million out in the past two years in a number of countries, and we ran a study and saw that 30% were telling us that they were applying more sunscreen and 60% were having less sunburn." The UV Sense will cost around $50 when it goes on sale globally next year, but until then L'Oreal is running a pilot program that people can sign up for. You'll only need to buy one sensor, which comes in a fancily designed box complete with adhesive to stick it to things. So fancy, in fact, because it was created by Swiss designer Yves Béhar, who once served as chief creative officer at Jawbone. Béhar designed the range of designs on the sensors too, all of which were on show and varied from single colors to patterns specifically made for men, women and what Balooch calls "ironic millennials". We didn't get to find out what that one looks like, but it's presumably something foreboding. Balooch also showed us the smartphone app, which not only tells you your UV exposure and the temperature taken from the UV Sense, but L'Oreal has worked on an API for taking local levels of air quality and pollen - although that part has nothing to do with the tiny sensor itself. One thing Balooch demonstrated was how you can use the app to track your run and tag it so the software can tell you the quality of the air you were breathing during exercise. You needn't worry too much about where you wear the sensor, said Balooch, though to work correctly it must remain on top of clothes. It's completely waterproof too and should last for several years before needing to be replaced, as long as you look after it. "As it's the first of its kind, once we get to the manufacturing level we'll see the range at which the electronics last," said Balooch. "We've done a number of tests for several months where we don't see any dilution of the amount of voltage. When it comes to years and years we'll have to see like every electronics company does, but we don't anticipate it will be any different." Balooch said that L'Oreal believes "very strongly" that "this is a field that makes sense" for the company, but this means it's come to appreciate the hardware and design challenges that come with making technology. But at the heart of all this, said Balooch, is a campaign "to get people to use UV products better and better". For L'Oreal, that will hopefully mean selling more bottles of sunscreen. For you, it might actually keep you from getting some serious sun damage.